Good morning! Here are the 10 things in tech you need to know to start off your week. 1. Coworking startup WeWork plans to cut 7% of its workforce and recently started a hiring freeze. The company insists, however, that the hiring freeze is only temporary. 2. Uber plans to expand its food delivery business to the UK. UberEats allows people to order food during a fixed window each day from selected local restaurants. 3. Facebook is forcing even more people to use its Messenger app. Facebook says it’s going to stop allowing people to send messages through mobile web browsers. 4. Mark Zuckerberg’s Twitter and Pinterest accounts were hacked. It’s probably due to the LinkedIn hack. 5. 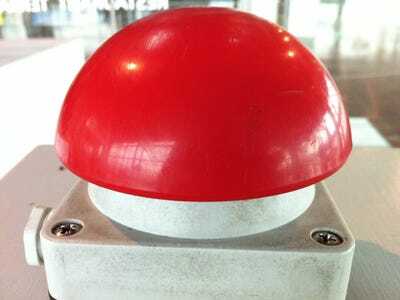 Google has developed a “big red button” that can be used to interrupt artificial intelligence and stop it from causing harm. DeepMind teamed up with scientists at the University of Oxford to find a way to make sure AI agents don’t learn to prevent, or seek to prevent humans, from taking control. 6. 100 million user accounts for Russian social network VK are being sold online. The data is being sold online for 1 bitcoin. 7. Snapchat secretly bought 3D selfie startup Seene. No price was announced for the deal. 8. An alleged staff member of Silk Road 2.0 was sentenced to eight years in prison. Brian Farrell pleaded guilty to a charge of conspiracy to distribute heroin, cocaine and methamphetamine. 9. Instagram made a change that stopped lots of third-party apps from working. It cut off API access for many different apps. 10. Vinaya’s emotion-tracking bracelet smashed its $100,000 (£69,000) crowdfunding target in 41 hours. It connects to your smartphone to filter notifications.